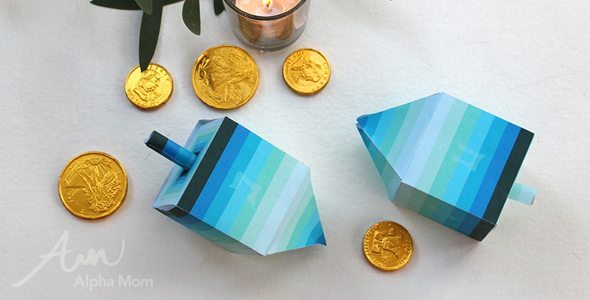 Hanukkah starts on December 6th this year, so we thought it would be prudent to make a quick paper Dreidel printable. And why not make it ombre since that’s what we like these days! 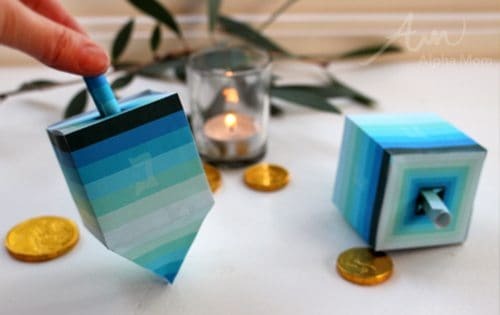 Follow this simple tutorial and you could be playing your own Dreidel Game (directions below) in no time. Or just decorate your table with them. 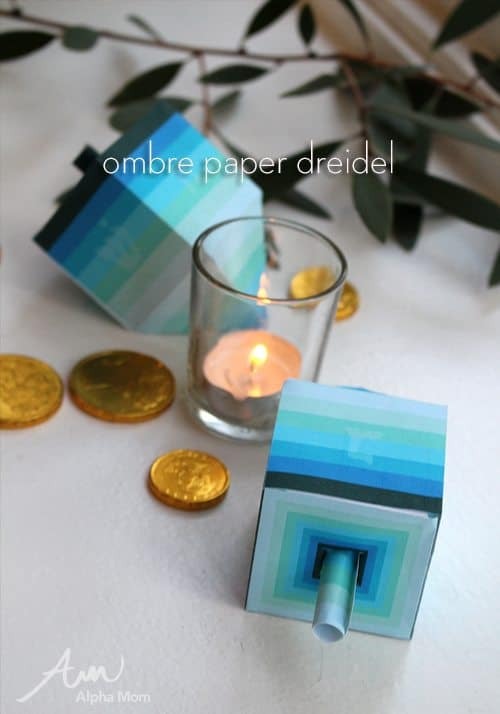 Click here to print our Dreidel template. Make sure you print on thick paper or cardstock. You can make these with regular computer paper (I did) but they won’t hold up for play for very long. It’s better to use paper sturdy enough so the top can spin on it’s point. Cut out your template along the outside lines. Score along all the folds. This is really important because without scoring it’s difficult to get the folds to line up properly when assembling. To score just use the back side of your exacto knife blade or the edge of a ruler if you are using scissors. You just want to give the paper some direction on where to fold. On the top square of the dreidel you will see a dotted “x”. Cut two small slits following those lines. This is where you will insert the handle of your dreidel later. Once you have everything cut out, start glueing or taping your sides together. I found that slicing up tiny pieces of double stick tape was a little easier than waiting for glue to dry but either works great. Finish with the top of the dreidel last. Then take the striped rectangle, roll it around a pencil and tape to secure. Insert this into the “x” slits on the top of the dreidel. Each player begins with 10-15 chocolate coins (aka Hanukkah gelt). Each player places one coin into the center playing area. Then each player takes a turn spinning the dreidel. If the dreidel lands with nun facing up the player wins nothing. If the dreidel lands with gimmel facing up the player takes all the coins in the center. If the dreidel lands with hey facing up the player takes half the coins in the center. If the dreidel lands with shin facing up the player must place two more coins back into the center. Each player must put one coin in the center before the next person joins the game, when the center is empty or when only one coin is left. When players do not have any coins left, they are out. The player who collects all the coins is the winner. For more in depth instructions see Wikipedia. 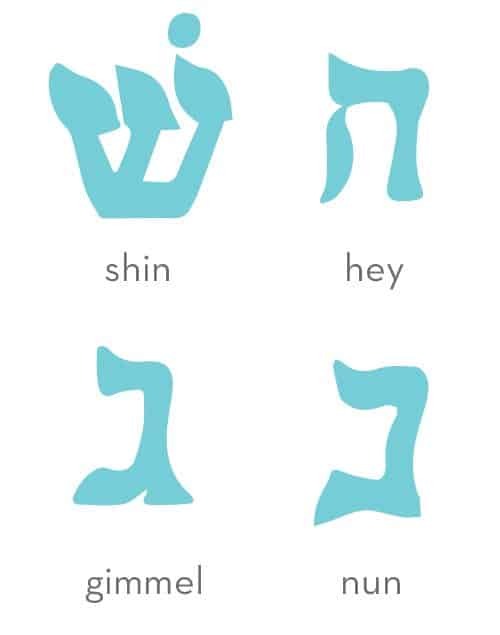 Here is a quick key for the Hebrew alphabet letters on the side of the dreidel. Hope you have fun! Happy Hanukkah!